Just hours before graduation, 13 year old Seth Clark was told by his school administrators that he could not give his planned speech. You can guess why. You're right. It mentioned God and quoted Scripture. Seth loves the Lord and wants to serve Him in everything he does. How many times have we heard that story before? Too many times. However, this time the people and the kid got very creative, and in their creative response to adversarial circumstances, Seth's message was heard, not only by the 100 in attendance, but by tens of thousands through the media. The Benton News reported, "The small Franklin County community of Akin, Illinois, doesn't even have a post office, but this week's controversy over an eighth grade salutatory speech has plummeted it into the media spotlight." When 8th grader Seth Clark submitted his speech, it contained references to "God-like forgiveness" as well as a quote from the Bible. School officials reacted to a single complaint regarding the content of the speech and hours before the graduation, Seth was told he could not give the speech. "As a public school, it is our duty to educate students, regardless of how different they or their beliefs may be. While students are welcome to pray or pursue their faith without disrupting school or infringing on the rights of others, the United States Constitution prohibits the school district incorporating such activities as part of school sponsored activities as part of school sponsored events, and when the context causes a captive audience to listen or compels other students to participate." The Benton newspaper then launches into a mini lecture on the separation of church and state, the Establishment Clause, etc. I'll spare you that part. The Benton News says, "The decision to disallow Seth's speech at the graduation ceremony drew the criticism of one Akin resident, Ricky Karroll." It actually drew criticism from many residents in the small town who believe in religious liberty. Karroll said he is friends with Seth's parents, thought the boy was being treated unfairly and offered his front yard as a venue for Seth to give his speech. He said Seth can invite everybody over when the ceremony is concluded---Karrol lives right across the street from the school. Southern Illinois WSIL TV 3 (ABC) got hold of the story. Karroll told the TV station he thinks Seth has a right to share what he believes---"We've always had a prayer in the past." He said, "We are still in the United States of America" and he has "the right to freedom of speech." Karroll also said, "I'm not prejudiced, but they (a Muslim) have a right to say what they want"...."if the school had told a Muslim they couldn't do that, somebody like the board or the ACLU would have been jumping down their (the school's) throat." He said, "Our money says in 'God We Trust', are we going to stop using that money?" 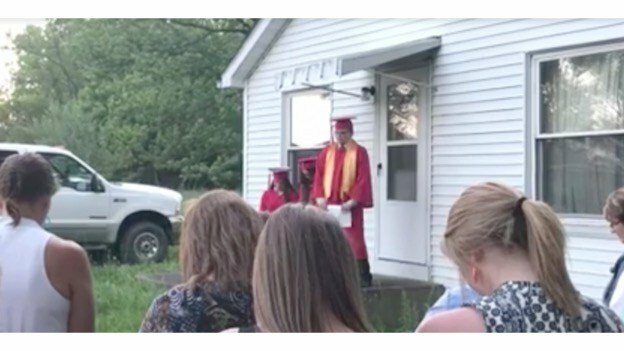 Seth stood up at the graduation and told the audience of about 100 or so that he would be giving his speech following the school sponsored ceremony across the street on the front porch of Mr. Karroll's house. Following the ceremony, Seth, still in his cap and gown led a procession of friends and their families across the street and gave his speech, his prayer and whatever else he wanted to say. Karroll said he counted at least 50-60 people. If Seth would have moderated his speech to conform, he would have given it to about 100 people---and he would not have been true to what he believed God wanted him to do and say. What seemed like a major set-back for this young kid who loves the Lord and wanted to say so---turned out to be a much greater opportunity. WSIL TV 3 not only reported this story, but ran Seth's speech as he spoke from the front porch of Karroll's house. Rather than 100 hearing, now due to the television coverage, the speech is trending on social media--as I write, tens of thousands have already viewed the boy's speech. It's a familiar story but it comes to mind. Joseph's dream was unacceptable to his brothers, to say the least. Their attempt to silence him created a path to God's purpose for Joseph's life. They meant it for evil, but God meant it for good. Be Informed. Be Vigilant. Be Bold. Be Prayerful. The superintendent and the principle ought to learn to read. The student giving the speech is not a part of the school educational system, but rather is a student who is being instructed by it. There is a difference. The school is not to interfere with a student's right to free exercise. This is a shifting of responsibilities, and liberty. It's backwards. I notice how they waited until the last hour to tell the student, a dirty deal there too, apparently trying to spring this thing on him while he had little time to think, and to add shock to promote confusion, frustration, and defeat, if they could. This is wrong in so many ways. The establishment clause as it's called applies to congress. This school isn't congress, either. I'm not saying it's right for a school to establish a religion by force on it's students, I'm just saying. Time for that school system to get back to America. Thank you Mr.Karrol for thinking out of the box. And Seth Clark, my God richly bless you in your schooling ahead of you. He has great things for you.Thank you for your courage, and especially your service to our Lord and Savior Jesus Christ. I find it sad when the teachers and administrators responsible for educating our young people have apparently not read or do not know the contents of the Constitution they are using to censor the free speech of their own students. Leading by example, no? It is one thing to praise and congratulate the Clarks for standing their ground in faith and obedience to our Lord. It is quite another for us to follow their lead! If their courage results in your "action" as opposed to only your "approval", then progress is finally at hand. The establishment clause is: "Congress will make no law respecting the establishment of religion". The Supreme Court had to distort the meaning of this clause to get prayer out of the schools because there is nothing more in the Constitution that could be used to do so. Nothing! No "separation of church and state"...no "nothing"! As accurately said, it applies only to Congress and it prohibits Congress from making a law, but does not enable the courts to take away other rights guaranteed by that same Constitution and Bill of Rights. The Constitution was designed to limit Government, not enable it to remove rights by slight of hand. The First Prayer of the Continental Congress "after" drafting and approving the Constitution is available on line. Congress, like the Supreme Court, opened all sessions with prayer. Washington D.C. building has tributes to our God carved in stone everywhere! So why were schools alone challenged? Because our children are the target of a secular evil that seeks to eventually ban God and religion through indoctrination of our children. Historical revisionism, bigoted manipulation of text books by freedoms enemies, and increasing "control" of curriculums by the Federal Government are clear evidence of the same. We can stand boldly to defend and promote our faith in our communities, in our schools, in our government. OR...we can sit in comfort quietly lending our gracious "approval" and "applause" for those who have to courage to do so, as if by doing so we are somehow contributing!